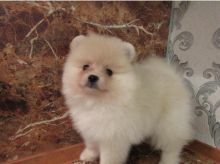 Puppies Available CKC registered Pomeranian. He is 11 weeks old and is vaccinated, dewarmed. They have had their shots and have an excellent temperament. They are registered and have all vet records and one year health guarantee.🐾💝🐾 Email at [ fabianrecaldo@gmail.com] Text at : 678-871-7681for more information.